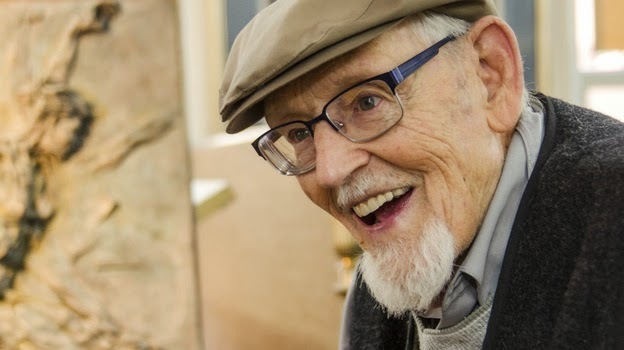 Colorado Public Radio produced a wonderful piece on artist and local living treasure Eric Bransby. It aired Saturday on NPR's Weekend Edition. An extended version will air on CPR stations (in Denver, Boulder and Pueblo) on Wednesday (1/7/15) at 6:51a, 8:51a and 5:50p. The segment will be part of a weekly podcast on cpr.org on Friday. You can see the transcripts and hear the original NPR report here. Since the 1940s, Eric Bransby has been among America’s most renowned mural painters. Over the course of his esteemed career, Bransby has developed a signature style of traditional Renaissance-based figurative compositions, and has adopted a strong abstract sensibility that allows him to integrate depictions of the human figure with architecturally-based geometric shapes. As a young artist in the 1930s, ‘40s, and ‘50s, Bransby nurtured his skills studying under renowned American artists Thomas Hart Benton and Josef Albers. Of great significance to the Fine Arts Center’s history is that he also studied under master muralists Boardman Robinson and Jean Charlot at the Fine Arts Center School, where he later taught. His association with these artists in the 1940s represents one of our enduring connections to the FAC's predecessor, the Broadmoor Art Academy. Bransby became an important muralist and draftsman in his own right, creating permanent works for Kansas State University, the municipal building in Liberty, Missouri, the University of Missouri, Brigham Young University, Colorado College, the Pioneers Museum, and the Air Force Academy among others. In the mid-1980s, Bransby was commissioned to restore the FAC’s badly-damaged façade mural originally painted by Boardman Robinson. Bransby, who still lives and works in Colorado Springs, received the 2007 Pikes Peak Arts Council’s Lifetime Achievement Award. At 98, Bransby continues to create art in his classic realist style and depicts the nobility of human endeavors.